Click the button below to add the Escena 1: Invitación by Cervantes/Wolf to your wish list. 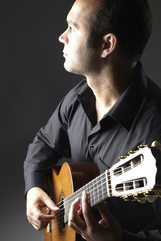 Scott Wolf is widely recognized for his versatility as a performer, teacher, and arranger for classical guitar. Scott received his Doctor of Musical Arts from the University of Southern California, where he studied classical guitar with renowned pedagogue and Los Angeles Guitar Quartet member Scott Tennant. He earned a Master of Music from New England Conservatory under the tutelage of Eliot Fisk and received his Bachelor of Arts at UC San Diego with Dr. Randy Pile. A frequent competition prizewinner, Scott won first prize in the Donald Miller Concerto Competition in 2009 and was awarded the “Latin American Prize” at Boston GuitarFest 2007 for his fiery interpretation of Latin American and Spanish music. Shortly after, he released a solo album of Latin-American music entitled Un Viaje al Sur (A Journey South). He also studied flamenco guitar extensively in Spain, and in the U.S. with Grisha Goryachev and Adam Del Monte. He gives frequent workshops on flamenco guitar, most recently to the participants of the Guitar Foundation of America Symposium in Los Angeles and the Loyola Marymount International Guitar Festival. A dedicated teacher, Scott serves on the faculties of both Palomar and Whittier colleges. Devoted to expanding the repertoire for guitar, Scott performs many of his own arrangements with the USC World Guitar Ensemble, Duo Solaris, and De Gracia y Pasión. Additional publications can be found via Clear Note and Doberman-Yppan Publishers. Scott is also the creator, producer, and host of the highly acclaimed podcast, All Strings Considered. I recommend to anyone looking for some great cuban music to just get the complete set of these. I am sure you will find out why I did, you will want to learn the set - Scott has a set of them for sale cheaper on this site than buying each movement by itself. Just a great work and arrangement I truly hope there is more to come. All prices are in USD Sitemap | Copyright 2019 Seconda Prattica.